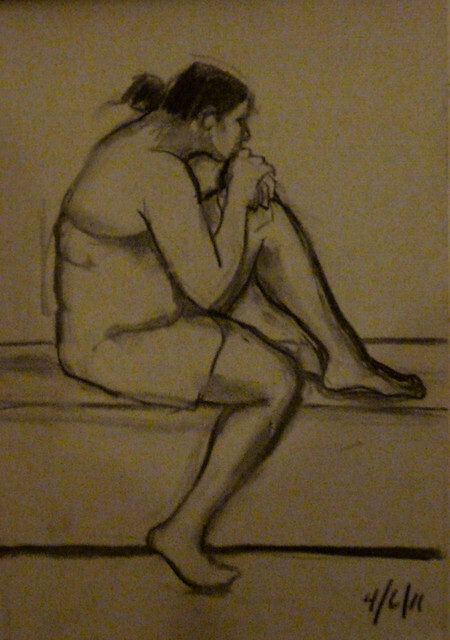 We had our second drawing session with a model at Sapumal earlier today. It’s been over a month since the last time we met but it looks like the pace will pick up now. It will be a more regular event and I’m truly looking forward to that. Took me 5-6 poses to get comfortable again and it was time to leave! The image above is from the last pose and it’s also the one I like the most. I was so pleased that today’s session coincided with Drawing Day 2011 as I could participate with these drawings for that too. For all those who missed their reminders online, scribble, sketch and/or draw and put them up for Drawing Day 2011. It ends tonight. And for those artists who live in Colombo and are interested in joining our Life Drawing group, get in touch by leaving me a comment here. hello maam..I have recently taken an interest in art and your blogs are very helpful…I am now looking for some art classes in delhi and I was wondering if you could help me find some short courses.. like upto 6 months or so..
hi kanika, my information is outdated. you could check out triveni, sangeet shyamala in vasant kunj and / or sign up for a year at the delhi college of art if they still have the option for auditing their bfa programmes. the admin offices / teachers at these places would also be able to give you information about other institutes / classes. all the best! I’m going to be in Sri Lanka for 4-6 months and I’m looking for a life drawing class to join. I’ll be working and studying full time, so a casual community type class is what I’m after – could you suggest anything? hi renata, there are two options that you could explore – one is to sign up for 15wk life drawing class at VAFA (Vibhavi Academy of Fine Arts) 20/108 (Salgaha Mw), Baddegana Rd, Kotte, Western 94011, Sri Lanka. +94 11 2 877309 and the second would be to get in touch with admin at the Sapumal Foundation and enquire about life drawing class run by friends inside the museum! I shall forward your email id to Oranea, who now runs the group, as well. all the best! Sapumal Foundation sounds like what I might be after. Thanks for the prompt response.